Only one day to go until the show! What you may not realize is that the all 80+ crafters are hard at work getting last minute work done for the show (some more frantically than others). The Crafters show is an exciting time for us - we get to meet with shoppers and with all the other crafters. Today's interview is with Kat Frick Miller of Fox Acre Row. 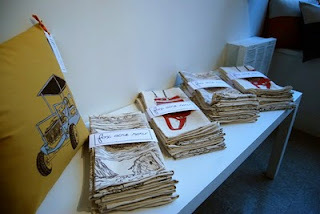 Screen-printed textiles. Pillows, fabric doorstops, t-shirts, placemats, tea towels and other such things. First and foremost I'm a drawer. I wander around my little part of the world, find something special and draw it. 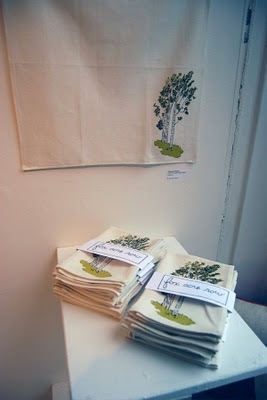 I then transfer my drawing to a screen, print it on fabric and sew it into something. I've been creating crafty things for as long as I can remember. 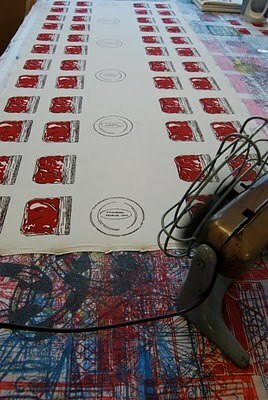 Partly because I love sending happy things out into the world, and partly because I'm afraid of what my life would be if I wasn't busy making! What is your background/How did you get started? I received my BFA at NSCAD. I concentrated on painting while I was in school, doing screen-printing on the side but since graduating screen-printing has consumed me. 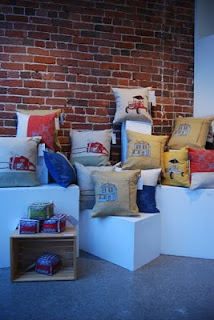 Seeds Gallery & Love, me Boutique in Halifax, Jenny Jib in Lunenburg or by contacting me through my blog. My first show was in Spring of 2008 at the North Street Church. After having a show or two under my belt I started volunteering to help organize and jury the markets. Everything! Everyone that comes to Halifax Crafters creates something very unique that I know I won't see anywhere else. What are you excited about seeing at the Holiday market? I have my old favorites like Blythe Church and Kyla Francis but I'm always most excited about finding something new. I usually get all of my holiday shopping done at the Halifax Crafters. I have a studio in my little house in Upper Kingsburg. If I'm drawing it is usually quiet time, however when I'm printing I need something loud and energetic. Once again Lunenburg County! My latest collection is pretty much a love letter to my new home. Over the past year I've had the chance to wander and explore this beautiful area of Nova Scotia and I've never been so inspired. Autumn. It's a lovely feeling to gather together everything you need for the winter, hunker down in front of the fire and wait for the snow. Oddly enough I procrastinate by doing everything I usually put off doing, like scrubbing the bathtub or doing the dishes.